The Overall Champion was MEEGAN CRANNAFORD. She is pictured front cover. JOSHUA BLAKE won the Men’s Fitness Class from a very strong lineup. 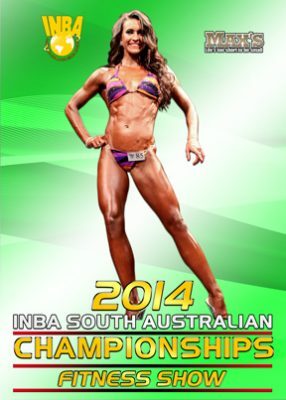 2014 INBA South Australian Championships – Natural Fitness Titles. The 2014 INBA S.A. Championships Fitness Show was the second of 2 events held at the Norwood Concert Hall on Sunday, September 21st. There were many wonderful competitors, and once again the depth and standard was outstanding. The Overall Champion was MEEGAN CRANNAFORD and she is pictured front cover. JOSHUA BLAKE won the Men’s Fitness Class from a very strong lineup. Enjoy over 2 hours of fabulous Fitness in this outstanding video which covers most of the contest through to the final comparisons and awards.